Today, we live in a world where society gathers knowledge faster than it gathers wisdom. It is a world of permanent revolution and change. Those who manage to find, structure and exploit the power of ‘Wild Knowledge’ – the untamed data, learnings and experiences that flourish in our lives and minds – will excel in business and life and come out as winners. We need to develop our ability to understand and judge which aspects of that knowledge are applicable to business and life in general. Wild Knowledge, written by the leading business philosopher Anders Indset, presents a powerful and radical approach to what leaders and businesses need today fixing ’the mind‘, ’the heart‘ and ‘the hands’ of the organizations, and how we can apply thinking, better self-awareness and practical philosophy into the business in order to come up with new questions and solve future challenges in our lives and businesses. Anders Indset is one of Europe’s leading business philosophers. He is a Norwegian-born occasional tech-investor based out of Frankfurt, Germany and a visiting guest lecturer at leading international business schools, founding partner of Frankfurt International Alliance (FIA) and an advisory board member of German Tech Entrepreneurship Center (GTEC). Known for his unconventional thoughts, provoking theses and rock star attitude, Anders is a trusted advisor for Global CEOs and leading politicians as well as a much sought-after international keynote speaker on leadership, change, technology, branding, and creativity. The wheel of information now spins so fast that most of live in a blur. How can we thrive in this disoriented state? 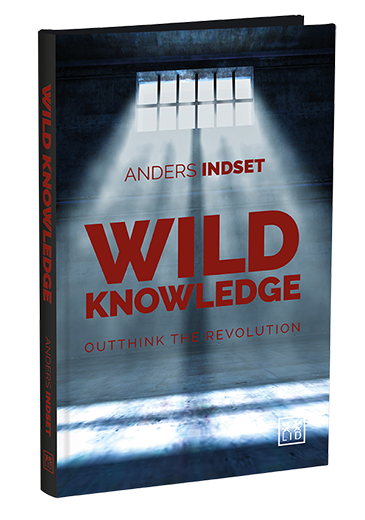 Anders Indset’s optimistic rallying cry is that yes, we can "out-think" the rapid change and disruption around us – and we must, if we are going to manage the future intelligently. Obviously, the world is changing. Responding to change requires action. The right actions require deeper knowledge. Wild Knowledge offers thoughtful insights and tools for deeper knowledge, even wisdom that offers the magic of ideas. What a refreshing shift from action for actions sake. Outstanding ideas; great read; and much needed. DAVE ULRICH - Rensis Likert Professor of Business, University of Michigan Partner, The RBL Group and listed on "Thinkers50" 2015. A passionate manifesto about our fast-paced world. Anders delivers solutions for the challenges of today and how everyone of us can shape what’s coming next. SYDNEY FINKELSTEIN, Professor, Tuck School of Business at Dartmouth College and bestselling author of Superbosses. Stew Friedman, Wharton professor and author of Total Leadership and Leading the Life You Want. A fresh perspective on rediscovering the art of thinking and bridging philosophy and business; a provocative read for 2017, offering guidance on how to stay ahead of the disruption game. Wild Knowledge offers important perspective on the role of business in the knowledge society. RICHARD FLORIDA, author Rise of the Creative Class and listed on "Thinkers50" 2015. Let yourselves be seduced by this passionate manifesto about our fast-paced world. Who better than Anders Indset to write this inspiring eye-opener on bridging the gap between philosophy, business and … Rock`n`Roll? You will be fascinated by this journey through science, technology, philosophy and the beauty of thinking. PROF. YVES PIGNEUR, University of Lausanne Author with Alex Osterwalder of « Business Model Generation » and listed on "Thinkers50" 2015. A passionate manifesto about our fast-paced world. Anders opens possibilities for solving today’s challenges by changing how we think. Wild Knowledge shows that how we think shapes how we act, and only by shifting how we think can we truly innovate and be ready for what’s coming at us in the 21st Century. Anders Indset’s keen blend of thoughtfulness and provocation is well placed for the times. JOIN THE JOURNEY WITH MORE THAN 18.000 OTHERS. GET YOUR QUARTERLY WILD KNOWLEDGE AND OTHER UPDATES. Titled anything from “The Rock’n’Roll Plato” to “The Digital Jesus” Anders engages, provokes, entertains and educates leaders around the world. As one of the worlds’s leading Business Philosophers with his new perspective to the „art of thinking“ he is on a journey bridging Business & Philosophy through practical philosophy. JOIN THE JOURNEY WITH MORE THAN 18.000 OTHERS. GET YOUR QUARTERLY WILD KNOWLEDGE AND OTHER UPDATES. SIGN UP NOW!